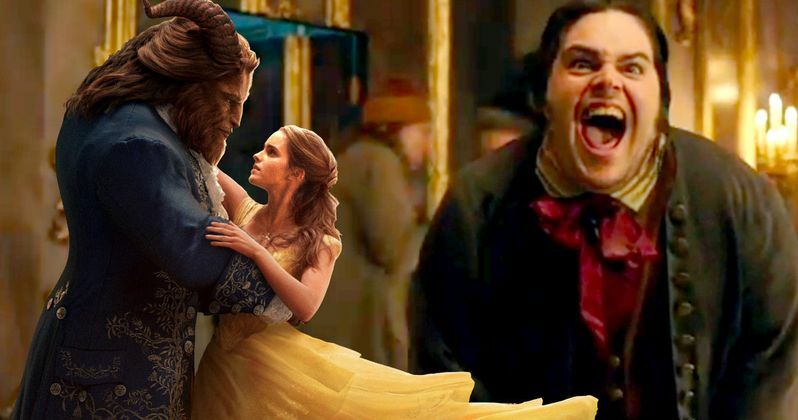 Disney's Beauty and the Beast, the live-action adaptation of the studio's animated classic, brought the story and characters audiences know and love to spectacular life and broke box-office records. Now the stunning, cinematic event arrives home on June 6 on Digital HD, Blu-ray, Disney Movies Anywhere, DVD and On-Demand. Disney has released a new Blu-ray trailer, along with details about the special features on this home video release. This latest sneak peek even showcases a deleted scene featuring Chip and LeFou! Fans who bring home Beauty and the Beast can celebrate the release with three ways to watch the movie, the original theatrical cut, the premiere cut with overture, and a musical experience with a sing-along version. The release invites viewers to get up close and personal with the filmmakers and cast to see how this beloved animated film was transformed into a new live-action classic, from the first enchanted table read to a fascinating look at how the film was brought to life utilizing lavish sets, elaborately designed costumes and props, and state-of the-art technology. A feature on the amazing women behind the enchanted tale hosted by Emma Watson; and over 10 minutes of deleted scenes along with musical extras, including the "Beauty and the Beast" music video starring Ariana Grande and John Legend, Celine Dion's heartfelt take on the new song "How Does a Moment Last Forever," and jump directly to all you favorite unforgettable songs. Bonus features on the Blu-ray and Digital HD kick off with an Enchanted Table Read, where fans join the cast for the movie's elaborately staged table read, complete with singing and dancing to live music, set pieces and more. A Beauty of a Tale explores the process of transforming a beloved animated film into a new live-action classic. The Women Behind Beauty and the Beast features Emma Watson introducing several of the talented women in all aspects of production who helped bring this enchanted tale to life. Making a Moment with Celine Dion features the singer sharing what it's like to sing "How Does a Moment Last Forever," and be a part of the legacy of Beauty and the Beast. From Song to Screen: Making the Musical Sequences lets fans see what goes into making some of the best-known moments from Beauty and the Beast. Belle features the filmmakers and cast revealing how it felt to shoot this memorable scene, Be Our Guest lets fans discover all that went into creating this epic, primarily virtual performance and Gaston lets fans join the cast for rehearsals and filming of this rousing, high-energy number, while Beauty and the Beast invites fans on set for the filming of this beloved, classic scene. There will also be a number of Deleted Scenes, with an introduction from director Bill Condon, who presents a collection of scenes that, for one reason or another, ended up on the cutting-room floor. The first deleted scene is Gaston Courts Belle, where a triumphant Gaston attempts to woo Belle, after settling a disturbance with the townspeople. Bread and Jam for Agathe shows Belle as she stops by to see Agathe, the village beggar woman, on her morning market rounds. Storming the Ice Gates shows the angry mob of villagers, led by Gaston, overwhelm the castle's defenses. Lumière Torches LeFou shows LeFou scuffling with Plumettem until he experiences a sudden, extremely heated interruption. Monsieur Toilette shows LeFou escaping from the brawl into a small room, where he's startled by a castle resident. Cogsworth Rescues Lumière shows Cogsworth leaping into the fray, when Clothilde the fishmonger threatens Lumière. Treacle the Lasses shows three village lasses chasing Chip and Froufrou, Madame Garderobe's dog-turned-footstool into the kitchen, where a surprise awaits. The final deleted scene is LeFou and Monsieur Toilette Reunite, where, after the spell is broken and the castle residents are returned to human form, LeFou and his new acquaintance meet again. There is also an extended version of the song: "Days in the Sun" where fans learn more about Beast's childhood, introduced by director Bill Condon, a Beauty and the Beast Music Video, where Award-winning artists Ariana Grande and John Legend perform a moving version of this iconic song, and a Making the Music Video feature, where you can go on set to capture the magic as it happens in Ariana Grande and John Legend's "Beauty and the Beast" music video. The final bonus feature is Disney Song Selection, allowing fans to jump directly to all your favorite songs and sing along with the movie. These songs include "Belle", "How Does a Moment Last Forever" (Music Box), "Belle" (Reprise), "Gaston", "Be Our Guest", "Days in the Sun", "Something There", "How Does a Moment Last Forever" (Montmartre), "Beauty and the Beast", "Evermore", "The Mob Sing" and "Beauty and the Beast" (Finale). The DVD includes the Beauty and the Beast Music Video. Beauty and the Beast features an extraordinary ensemble cast, including Emma Watson as Belle, Dan Stevens as The Beast, Luke Evans as Gaston, Kevin Kline as Maurice, Josh Gad as LeFou, Ewan McGregor as Lumière, Stanley Tucci as Maestro Cadenza, Audra McDonald as Madame de Garderobe, Gugu Mbatha-Raw as Plumette, Hattie Morahan as the enchantress and Nathan Mack as Chip with Ian McKellen as Cogsworth and Emma Thompson as Mrs. Potts. Directed by Bill Condon and based on the 1991 animated film "Beauty and the Beast," the screenplay is written by Stephen Chbosky and Evan Spiliotopoulos. Alan Menken provides the score, which includes new recordings of the original songs written by Menken and Howard Ashman as well as three new songs written by Menken and Tim Rice. The film is produced by Mandeville Films' David Hoberman, p.g.a. and Todd Lieberman, p.g.a with Jeffrey Silver, Thomas Schumacher and Don Hahn serving as executive producers. Here's what Bill Condon had to say about this story in a statement. "There's something about this story, and specifically the score, which was written 25 years ago, that is just magical, and I think that's what still draws people in and is what makes this such a special experience." Thanks to the artistry and imagination of Condon and a brilliant creative team, audiences of all ages are sure to be captivated by the story's music, adventure and romance once again. In addition to the trailer, we have the Blu-ray artwork that you can check out below. Take a look at the Blu-ray trailer, courtesy of Disney Movies Everywhere and artwork for the new Disney live-action classic Beauty and the Beast.